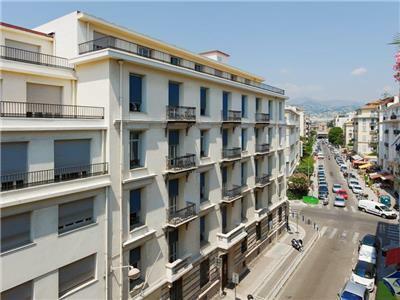 The building is only 5 years old and has been newly furnished in June 2013 - there is a double sofabed, dining table and 2 chairs, large flatscreen (internet) smart TV (internet features) French Satelite TV with English news channels and Wifi/internet. 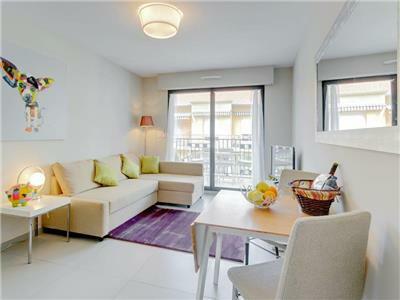 From the livingroom is a large terrace with table and 4 chairs and 2 reclining chairs - the terrace gets the afternoon/evening sun as faces West.The apartment has a very good bedroom with a quality kingsize bed (2m x1.6m) storage cupboards, bedside tables and flat screen TV. 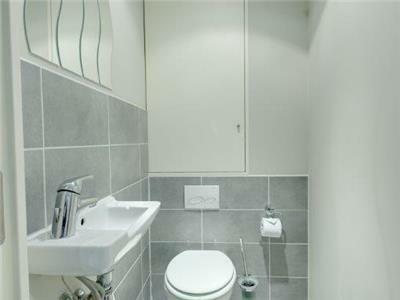 the bedroom is at the rear of apartment and very quiet - it has air cooling system.There is a shower room - with quality walkin shower, handbasin and washing machine - there is a separate WC. The kitchen area has fridge with freezer compartment, 4 plate hob, microwave, dishwasher, kettle, toaster, Nespresso coffee maker and full utensils. 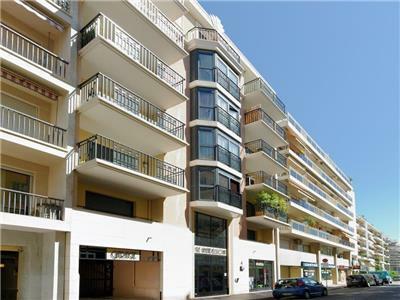 The apartment is in a modern building (5 years old) the building is quiet with only approx. 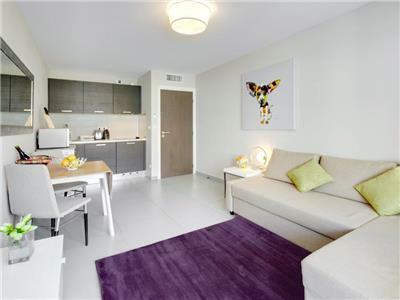 16 apartments in total - large lift - very secure (entry fob and lift code) and quiet. The apartment has a very efficient air cooling/heating system (more natural process) and works well. The building is done as Art Deco style. 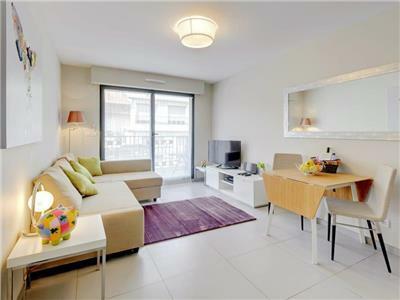 This is a very good quality apartment with modern furnishings (furnished summer 2013) ideal base for couple or small family." 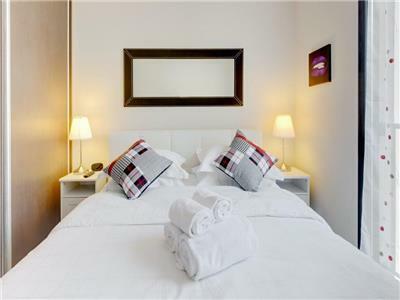 This apartment comes with linens and towels and main bed made-up for 2 persons. Additional services: (if required) please request in writing once you have booked. Any additional services will be paid in cash in envelope provided at the end-of-your stay. We are here to make your stay a very pleasant and enjoyable one any questions we are here to help - Paul Manion & The Go-Nice team. Nice central train station	 Train Station 387 m.
Place Massena	 Tourist Attraction 752 m.
Negresco Hotel	 Hotel Motel 813 m.
Cours Saleya	 Tourist Attraction 1165 m.
Old Town	 Tourist Attraction 1308 m.
Place Garibaldi	 Tourist Attraction 1406 m.
Castle Hill	 Tourist Attraction 1608 m.
Nice Port	 Tourist Attraction 1.77 km. Promenade des Anglais	 Tourist Attraction 2.16 km. 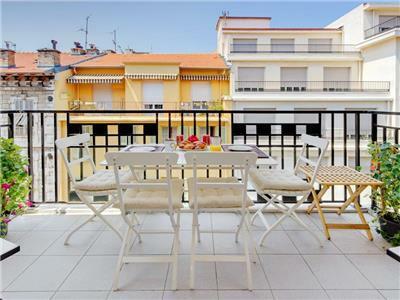 The apartment's location in the Musicians Quarter was very convenient--close to everything, but residential and quiet. 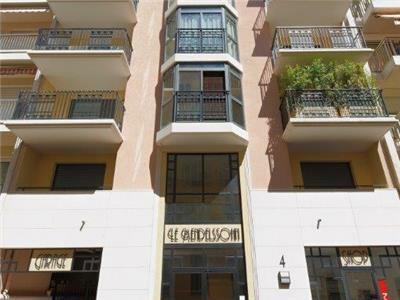 The building is nice and secure, the apartment as described, and the wifi and satellite television worked well. Overall, though, we had a very positive experience and would recommend the apartment. From the moment we booked we had nothing but excellent customer service from Go Nice. The slick service continued throughout, from collecting our keys at the airport to the welcome basket waiting for us on arrival at Sunshine Terrace. 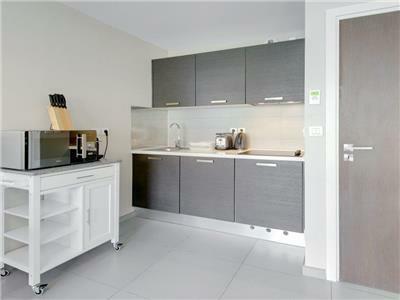 The apartment was spotlessly clean and had every amenity we could wish for. 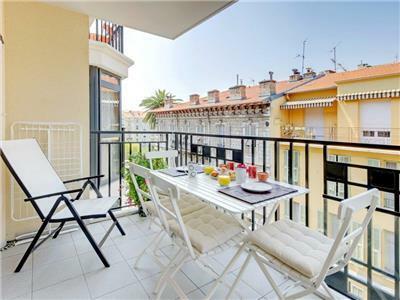 The location is excellent (five minutes' walk from the train station, five to the seafront and ten minutes to the Old Town). The king size bed was comfortable, the kitchen had everything we required and the shower was good too. The washing machine is a bonus - it was great to bring home clean washing and save a job on our return to the UK! 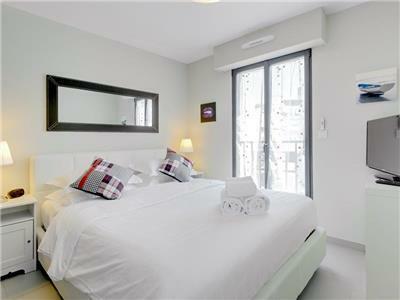 We wouldn't hesitate to recommend Go Nice and Sunshine Terrace to anybody and we would definitely stay there again. 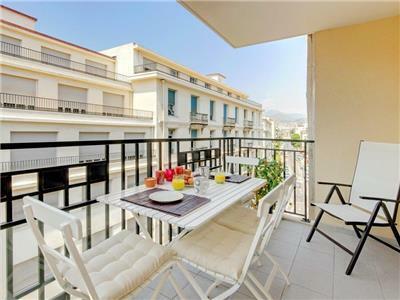 Our stay in Nice was fantastic, a big thank you for the professionalism of the Go-nice team, we stayed in 'Sunshine Terrace' apt and we felt secure and it had everything we needed with beautiful decor. We have already recommended it to several people we met there from Ireland. To Paul and staff at Go-Nice a big thank you. We returned to this apartment having stayed here last year. 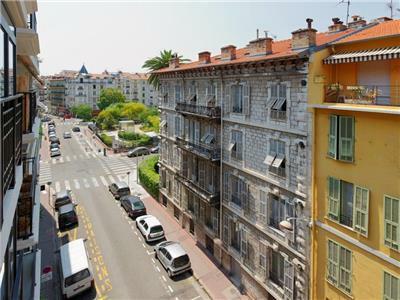 Great location for any place you require in Nice. Lovely sunshine balcony for dinner in the evenings. 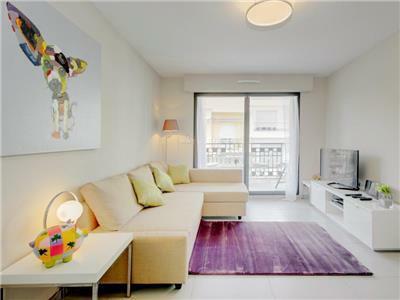 Very clean foyer, modern secure lift and quiet up market building. 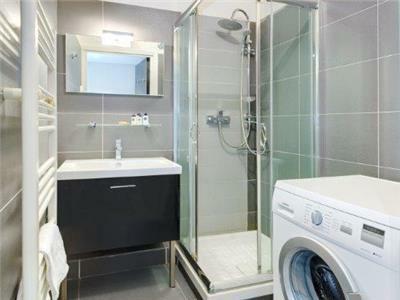 Air con and everything you need in the apartment. Seriously thinking of booking for 2015 we like it so much. Head Office: The Go Grp Ltd, 5 Theale Lakes Business Park, Moulden Way, Sulhamstead, Reading, Berkshire, United Kingdom, RG7 4GB.